Simon Williams is the author of the Aona dark fantasy series, which is attracting growing acclaim for its fusion of different genres and atmospheric, character-driven narrative. He has also written "Summer's Dark Waters", a sci-fi / fantasy /supernatural novel aimed at young adults. The interview series of "Art & Beauty in Weird/Fantasy Fiction" engage contemporary authors & artists to reveal their muses, so let us learn more about the Aona series which was just concluded. SEL #1) What is Aona? SW: Picture a distant world, probably in the distant future, where most technology is no longer even a memory. A world which for a number of reasons is like no other. A world where two great powers will struggle for control. One of them has crossed great swathes of the known Existence to find this world, the other has controlled, nurtured and dominated it in one form or another since the dawn of known time. Thus two opposing, universal forces are preparing to destroy each other. One is an implacable, faceless destroyer of worlds- the other is the ancient master of all the races that live on this world- Aona. Caught in the midst of all this are the races of this world, human and non-human. Both supreme powers, in the simple terms of the Younger Races, are evil beyond comprehension. The story of Aona is not a fable of good versus evil. It's a tale of incomprehensible forces, survival, corruption, greed, betrayal, and above all else, the gradual realisation amongst the main characters that this war is not simply a struggle for one world but something far, far greater. SEL #2) With Aona being dark fantasy; do you see any excerpt or book as "beautiful"? If so please give an example and explain. SW: My work often seeks to combine striking beauty with stark horror. I don't actually think the two are that different at all sometimes. In my youth I often sought to describe in great detail and provide explanations for everything- but over time I've found that a sparse turn of phrase will often work far better if the reader has imagination and intelligence. In terms of other authors' works that I would term "beautiful" some of the most achingly gorgeous and emotive prose I've ever read appears in Celia Dart Thornton's Bitterbynde Trilogy and Crowthistle Chronicles. SEL #3) I see from a previous interview that you have listed Clive Barker as an influence; he is known for being a graphic artist as well as a horror author. Do you create art in other mediums than writing? If so, can we share a piece (illustrated/photo, or audio of music, etc.). SW: Sadly I'm no artist- I do enjoy drawing (or doodling, in my case) from time to time, but I have no illusions whatsoever about my ability in that area. I can't draw or paint or do anything like that. Sometimes I think that's a shame because I can vividly imagine a certain scene in great detail and keep that exact image in my mind for a very long time- which would be really useful if I could draw or paint. I play piano / keyboards and I have various compositions recorded although they're not really good enough to be shared. I even have the beginnings of a classical symphony that I had begun to create to work in tandem with the Aona books. That may sound pretentious but again I have no great illusions about the quality of my musical works. I think they're ok, but if something is just "ok" that means it isn't good enough to be shared with the world. This perhaps ties into the reason why my output has been quite lean- I have a number of unseen works, some of which are complete and others which are at various stages, which I feel are just not "right" (that's why they're unseen). Luckily I have been able to collaborate with an artist friend of mine (her website is ankolie.com) on one of my books already (Summer's Dark Waters) and hope to on future works as well. Her vision matched mine so exactly for that book that it was astonishing. SEL #4) Can you describe more about working with illustrator Ankolie? Any feedback about sharing the control of expressing "your world"? SW: It was a privilege and I certainly intend to work with her on future projects, particular those aimed at younger audiences which I feel benefit from more artwork. Ankolie managed to perfectly encapsulate the vision I had for my characters in Summer's Dark Waters, there was no need to adjust or change anything, which was remarkable. 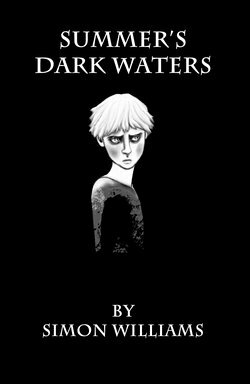 SEL #5) Please discuss more about writing horror for various audiences: Young Adult vs Mature Readers (Summer's Dark Waters vs Aona). Did you feel constrained with Dark Water's? SW: I certainly didn't feel constrained with Summer's Dark Waters, I find it's perfectly possible to make something "scary" and exciting without resorting to overly graphic descriptions. It was a challenge initially to make my style a little less complex but I soon got into the swing of it, and as with my other others the characters ended up helping to carry the story. One of my new projects is actually a book for even younger readers which is actually a greater challenge still- we'll see if that works out. I don't really feel that there needs to be much difference in style and content between Young Adult and Adult if the reading age of the reader is high enough. I'm not a big believer in censorship- there are far worse things in the news every day than in the books of 99.99% of authors! SEL #6) Are any of your characters artists? Can you talk about their motivations? SW: Alexia, member of a ruling family that met a very unpleasant end, is more a polymath but would include art amongst her skills. Nia is an assassin but would consider herself an artist (in the first few books anyway) based on the kind of work she does and her attention to detail, not to mention the sometimes unusual methods (see Oblivion's Forge for an example). Her motivation? Perhaps the intensity of her work helps her bury the past. Nia is one of the more complex characters in the series and I think her motivation in all things changes many times through the saga. SEL #7) What are your muses? Are you trying to capture/contain/control particular horrors or fears? SW: On the contrary, I'm tapping into the deepest recesses of my imagination in order to find things I perhaps didn't even know existed, and then let them go. In my experience, fear can't be contained forever; sooner or later it needs to fly free. SEL #8) The runic covers have always caught my eye. Are they Scandinavian/Futhark? Something else? Please discuss the choice of coverart for the Aona series. SW: I came up with the symbols and their meanings, and intend to explain them in detail in my Aona "guide" which I'm slowly compiling. They've proved popular and have certainly drawn people to my work. I consciously chose to avoid the usual fantasy tropes and cliches when I first thought about the covers, and decided a sparse, enigmatic motif would be ideal for the books. The Aona series bridges genres other than fantasy as well, so coming up with a common visual "standard" for the books might have been difficult with anything more involved. The books are fairly complex and so I also wanted to use something clean and stripped-down as a counterpoint. SEL #9) Please share your own thoughts about the creative process. Anything peculiar about your methods? Suggestions for others? SW: To be honest, I have no particular method. I write, I write some more, I keep writing, some of it's good and I keep it, some of it's bad and I scrap it, some of it's ok and I edit it. Sometimes it's a struggle to wade through the "creative mire" as I call it, and at other times I just sit down and it kind if happens without my really knowing about it. I like to have a title before I even start, and quite often I'll know how it all ends a long while before the middle bit and the bulk of the plot is in place. Basically it all starts with a vision, and I know that if I stick to that vision and the skeleton of the plot, in time everything will come together. That's the way it's always been. That messy, chaotic way of working won't work for everyone, so I can't necessarily recommend it. It works for me though. Weston's Hell Bound- Hell can be fun!